Lock in a great price for Grace Hotel Santorini, Auberge Resorts Collection – rated 9.2 by recent guests! We loved everything about this property! The views, The food, The room, The hot tub, The staff were all superb! Enchanting. First rate views,first rate service,first rate food,first rate rooms. One of the best hotels I've been to. The staff was amazing! They went above and beyond. The views were the best views I could ever dream of! Came here for our honeymoon, could not have dreamed up a better place to stay! The breakfast is a full 5 course meal and some of the best we’ve ever had. Highly recommended! Location is spectacular, service is super friendly. 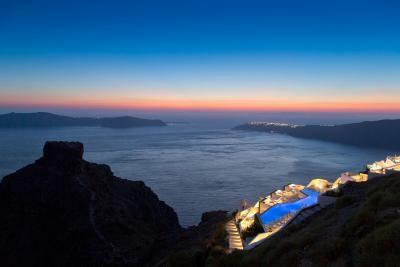 A luxury boutique hotel with stunning views over the caldera. The whole set up is designed to deliver a special experience and it succeeds. The property was exceptional. The staff friendly and very helpful. This is not your average hotel, so you would expect everything to be pretty luxe, and it is. Thanks Grace Santorini for a memorable 7 day stay. The room, food , and stafff amazing. The breakfast and views well worth it. Outstanding service and wonderful staff, the attention to detail is incredible. Staff went out of their way to ensure we were happy and comfortable. Upon arrival my spouse had developed a heat rash and the staff were quick to look after obtaining a hydrocortisone cream from the pharmacy. Extremely comfortable accommodations, fabulous 5 course breakfast and spectacular views. We stayed at a superior suite, #16, at the top of the resort. Extremely private and quiet. 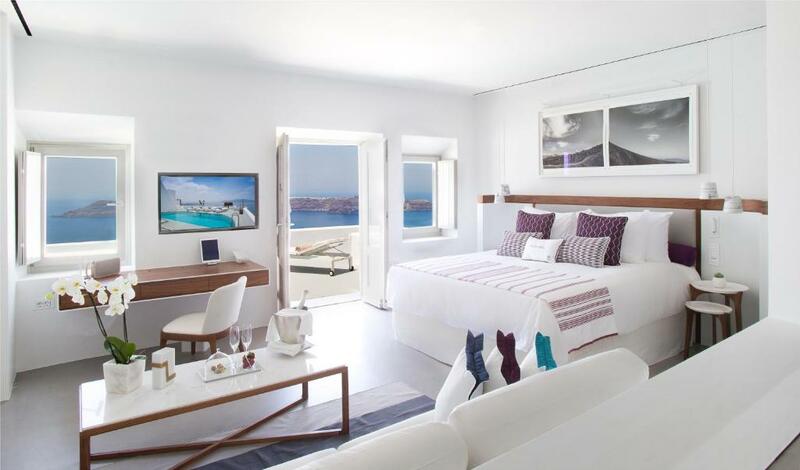 Grace Hotel Santorini, Auberge Resorts Collection This rating is a reflection of how the property compares to the industry standard when it comes to price, facilities and services available. It's based on a self-evaluation by the property. Use this rating to help choose your stay! 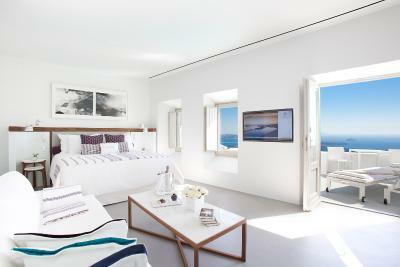 Located 1.2 mi from Fira, the award-winning Grace Hotel Santorini is an exclusive boutique hotel offering luxurious accommodations with panoramic sea views and free WiFi. It features an infinity pool and provides in-room spa treatments. The modernly decorated rooms and suites feature design items and include a satellite TV, DVD player and a balcony. Some units also have a separate seating room and a plunge pool overlooking the sea. Grace Hotel guests can benefit from a variety of services that they can request prior to arrival, such as bathroom amenities, Apivita cosmetics, in-room fitness kit or seven-choice pillow menu. 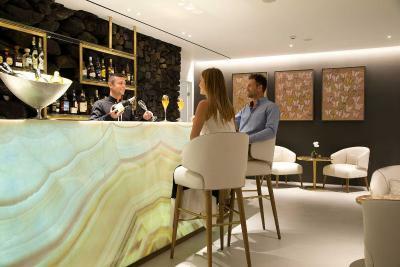 They can also choose among a wide variety of in-room drinks or special romance packages. The sea-view restaurant serves Mediterranean fusion cuisine in its elegant interior or at the terrace. A 5-course champagne breakfast is served daily, while guests can also enjoy cocktails, refreshments and light meals at the hotel's pool bar. Grace Hotel Santorini can arrange boat trips to nearby islands and private daily cruises. A complimentary use of laptop and iPod is possible at the reception. 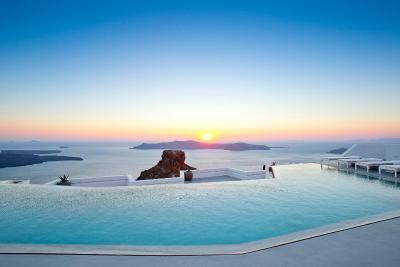 Located in Imerovigli village, the hotel is 5 mi away from Santorini Airport and 6.2 mi away from Athinios Port. 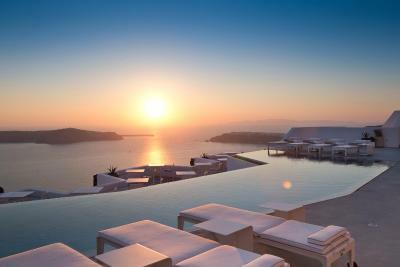 When would you like to stay at Grace Hotel Santorini, Auberge Resorts Collection? 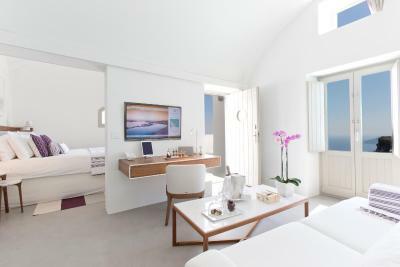 The luxurious Grace Suite offers accommodations with glorious views over the Caldera and the Aegean sunset. Each Grace Suite opens out to a terrace which features comfortable sun loungers, a seating arrangement, and an alluring private heated plunge pool. The suite includes a spacious bedroom with a king-size bed, a Smart-System TV, and a comfortable seating area. An ultra-luxurious private bathroom features a steam bath and a separate interior heated plunge pool featuring views of the horizon. The VIP Suite offers unobstructed views to the Caldera and Skaros Rock. It features a private entrance and has the largest terrace and personal heated plunge pool in the hotel, which includes a seating arrangement beside a double sun lounger. This suite also has an innovative and unique lava rock feature in front of a panorama window, which adds to the privacy feel and creates light displays as the sunlight filters through. 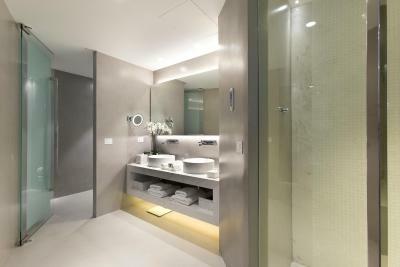 The bedroom includes a king-size bed, Smart-System TV, and an private bathroom that features a shower/steam room for 2. The Superior Suite has a generous terrace with panoramic views over the sea, a personal heated plunge pool, sun loungers, and seating and dining area. A spacious bedroom features a kingsize bed, Smart-System TV, and an private bathroom. Elegantly furnished honeymoon suite with views towards Thirasia island, Oia and the Aegean sea.They have spacious seating room and exterior terraces with private plunge pools. The softly furnished bedroom features a comfortable kind size bed. Each individually designed Junior Suite offers spacious accommodations with its own distinctive touches of style. The terrace has views of the Caldera and features a personal heated plunge pool, complete with an outdoor seating arrangement. 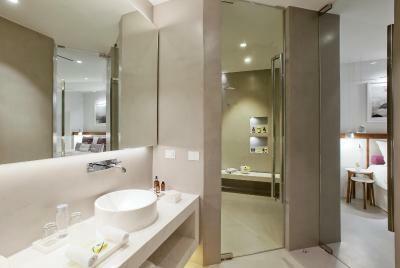 Inside the Suite, there is a king-size bed, open-plan living area and a spacious bathroom with an over-sized shower. The Junior Suite offers spacious accommodations with its own distinctive touches of style. It features a king-size bed, a spacious bathroom with shower, and a large open-plan living area. The suite leads out to a terrace that features a double sun lounger and views of the Caldera. 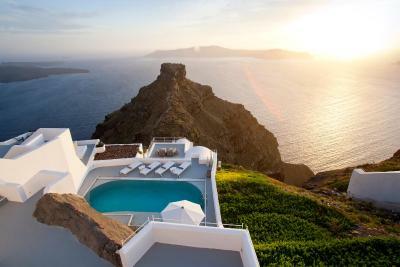 Grace Suite offers accommodations with glorious views over the Caldera and the Aegean sunset. Its terrace features comfortable sun loungers, a seating and dining arrangement, and an alluring private heated plunge pool. 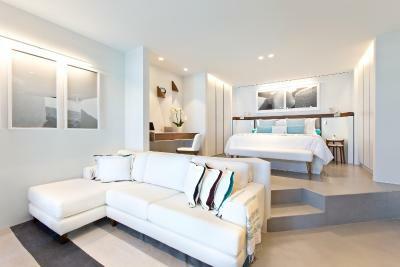 The suite includes a spacious master bedroom with a king-size bed, a Smart-System TV, and a comfortable seating area. An ultra-luxurious private bathroom features a steam bath and an interior heated plunge pool featuring views of the horizon. 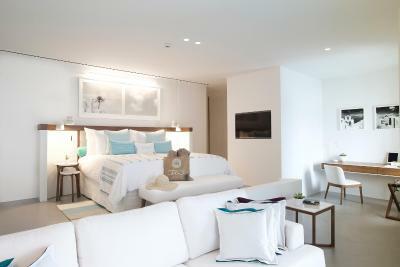 The interconnecting additional bedroom also features a king-size bed, a Smart-System TV, its own bathroom, spacious terrace, and a personal heated plunge pool. The Deluxe room with plunge pool has a king-size bed, a Smart-System TV, and an private bathroom with shower. The terrace features a personal heated plunge pool and a seating arrangement to enjoy views of the Caldera, Skaros and the Aegean sunsets. The Villa has its own spa with a steam bath, an indoor plunge pool, and a treatment room to enjoy Grace Santorini's full range of treatments in absolute privacy. The open-plan kitchen is equipped with a pre-stocked refrigerator, wine and cigar bar as well as a private chef available on request. Guests may unwind with Smart-System TV and a book library. Villa technology includes secure WiFi, iPad, and mobile smartphones pre-loaded with useful local numbers. The outside spaces, extending over 820 ft², offer breathtaking views. Double-level seating areas and sun decks overlook the private heated swimming pool, outdoor fireplace and gazebo. A dedicated personal service attendant is available on request. 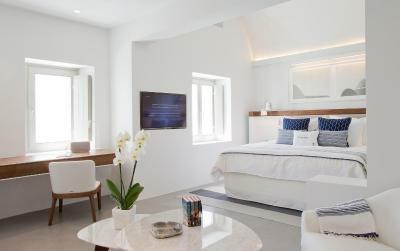 House Rules Grace Hotel Santorini, Auberge Resorts Collection takes special requests – add in the next step! Grace Hotel Santorini, Auberge Resorts Collection accepts these cards and reserves the right to temporarily hold an amount prior to arrival. To have the added, in-room services, guests are asked to contact Grace Santorini prior to arrival and request the Bespoke form for selecting the services of their choice. We did not like the location of the honeymoon suite. There was quite a number of brides and photographers daily right outside of our room having photo shoots. We felt like we were on display while sitting in our hot tub. VERY VERY dissatisfied with that. This should not Be allowed!! You will have No privacy what so ever and any thoughts of romance or being naked in your hot tub will be squashed. We were in room 64. The hotel should lobby for the privacy of there guests that are paying over $700 dollars a night for their stay! The guests in the room next to us had a wooden type of fence for privacy blocking their hot tub but their heads were parallel with the bottom opening of 4-5 inches and could look right at us when sitting in their hot tub. So it’s an illusion in essence. That is something that can be corrected. Additionally the skaros rock although beautiful was blocking the sunset. One last tip. You WILL be walking 207 steps every day to get to the main areas of restaurants and shops. It’s a Caldera so “all natural” no elevators. i liked the location it was amazing. The staff and service far exceeded my expecations. Lack of privacy. Noisy air conditioning. Nice pool and excellent food. The view from the room was amazing perfectly facing the sunset. It is for people who enjoy calm atmosphere. Delicious 5 course breakfast in the terrace. Great team running a beautiful hotel. Sometimes the staff were a little slow or direct. Room service way over priced - €12 for one scoop of ice cream! Ideal honeymoon location, plunge pool a bonus! Excellent breakfast. Bar made excellent cocktails! Drinks were a little too expensive but everything else was perfect. Excellent hotel in a truly beautiful location with breathtaking views. All round 5 star service from the time we were greeted on arrival until the day we departed. The suites and the rest of the hotel maintained immaculately clean and tidy. The manager, George, was very welcoming and engaged with residents at appropriate times to ensure everything was well. A hotel that puts service first ! The morning we wanted to do yoga the instructor didn’t show up. The young boy serving breakfast needs a bit more training. It’s pricey! Staff are excellent!! The meals in the evening were some of the best I’ve had and being vegan the chef went above and beyond to accommodate this. The location and view are amazing. Fantastic hotel, pure luxury!! The staff can not do enough for you and the attention to detail is expectional !!! The food is out of this world! Thank you for the most wonderful holiday! We will be back again!